Forum Index > Historical Arms Talk > Finish on ancient iron swords, knives etc. Posted: Fri 21 Jul, 2006 2:14 am Post subject: Finish on ancient iron swords, knives etc. I know this is a topic discussed before, but I thought I'd bring it up again due to some new insights I've recently had. Since I've recently picked up forging, I've been wondering about the finish of ancient iron artifacts. Modern reconstructions tend to either go for crisp, clean finish or raw unfinished. I've just been working on an early iron age knife, and I was surprized at how deep into the metal the corrosion goes due to the forging, and just how much metal has to be ground away to remove all the traces of forging and get a clean finish. I realize there's probably a lot of factors involving the corrosion (oxydizing of the fire, time spend forging, forging temp, type of steel etc. etc.). But if this level of corrosion is in any way indicative to what the original smiths may have been faced with before the arrival of power tools and metalworking files, then creating such a fine finish is quite a daunting task. 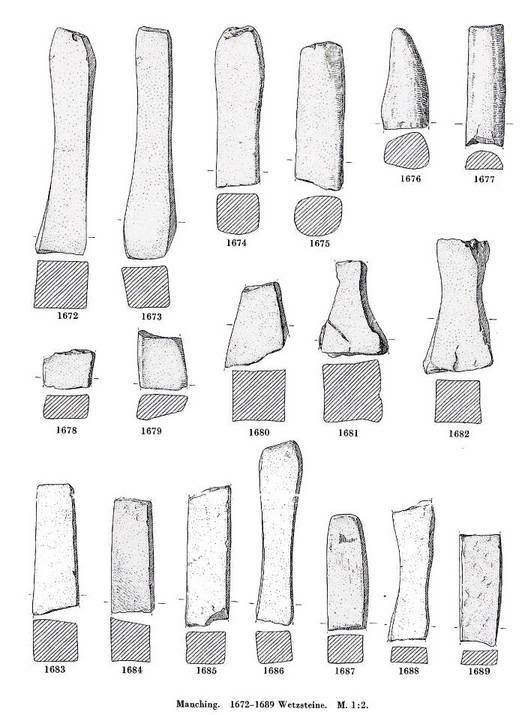 So that brought me to the question, how far did the ancients go in finishing their forgings? 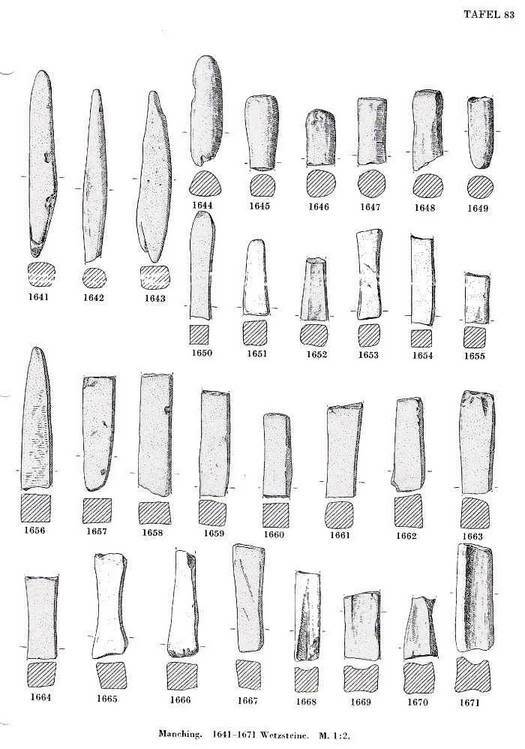 How far was the average knife or sword finished after forging in say the iron age, Roman period, migration period etc.? There would have been a lot of variation of course. But my guess is that a great majority of tools and weapons that were made may have been finished just far enough to make them functional. There probably also were a lot of pieces with a mostly cleaned surface. But considering that removing the last 10% of the marks generally takes 90% of the work, I'd guess a lot of pieces with a lot of attention to a nice finish would still have various spots here and there. It would be very hard to distinguish these marks from the corrosion after deposition on originals though. Though if the surface is still in a good condition, the shape and nature of forging marks could potentially help recognizing them. 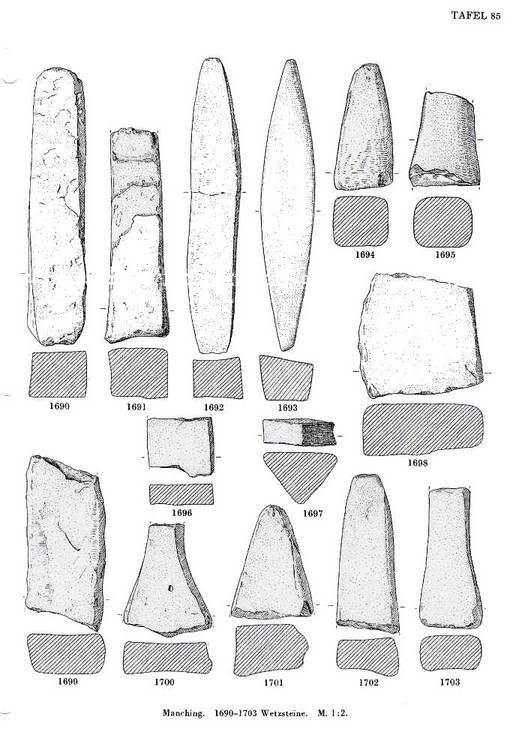 Looking at some ancient pieces, I could pick out some examples with the surface preserved that indicate that they were left in forged state, with hardly any grinding done on them. Below you can see an iron age knife and leather knife. Both still clearly show the hammer marks on them, which means that little to no grinding was done on them. Another example is a migration era sword. This sword is hardly more then a bar of iron with an edge thinned down and a fuller (crudely) hammered into it. The raw shape of this blades make it highly unlikely that much grinding work has been done at it as well. I realize of course that these are probably the low end pieces. There's definate examples of very finely finished pieces. Especially in patternwelded swords f.e., there was an enormous amount of grinding work involved. So by that time, I assume the grinding methods were either just efficient enough to make it worthwile, or they didn't mind spending huge amounts of manhours on a blade (and as a result also having a low production quantity). I participated in many, and sometimes overheated, discussions about this topic. The main reason the discussions become heated is that there is no easy answer to this question. But I can tell you a few points describing my view, developed while working as an archaeologist and as an producer of a wide variety of historic replicas. I think that most tools weren't polished at all, apart from being sharpened. An axe for example oxidates far more easily in a polished state than it would with the original stable oxidated surface it obtains during the forging. If you look at weapons it becomes far more complicated. Where was the weapon made? For what exact purpose was it made (apart from killing people )? When was it made? And, very important, for whom or what kind of person was it made? There are few unpolished blades today. Those few were produced exactly the same way as a more polished blade, just the "decoration" was left aside, which give those pieces a very primitive appearence. How many pieces like that existed in proportion to highly polished pieces we do not know, since those simple blades were not preserved in an armoury. But even blades that appear highly polished today may have been unpolished once. Many blades today were or are part of a collection and sadly most collectors like their blades shiny, so they polish them until the original surface is destroyed. Almost the same happened to the pieces preserved in armouries, but most of those were not subject to such a thorough modern grinding, so the original surface can still be judged. Tools in a laboratory, like a binocular, are very helpful to discover small areas on those blades which still show the original surface. Most blades I had a chance to look at, mostly german ones, still showed some pits from the forging and scratchmarks from polishing (whether those marks are part of the original surface is almost impossible to say). Most people are not able to see a difference between the pits from the forging and the pitting the blade developed while rusting. A blacksmith however will see the difference. Many reenactors today prefer highly polished blades for reasons I do not understand, since I prefer to see the blacksmiths "mark" on a blade. Granted, those modern highly polished blades a far easier to clean. It is also important to remember that the chrome content in old steels was not as controlled as it is today. Chrome is more a natural impurity than a controlled part of the steel. So, historical blades appear more grey than silver when polished. Of course there are written historic soures which talk of a mirrorlike appearance, but you have to remember that those writters did not know such mirrors as we have today. Highly polished historical blades, just like modern ones (if strictly handmade without any kind of electric tools), are of course much more expensive than less polished ones. Then, just like today, only someone with a bigger purse could afford such a blade. It is not just the size of the blade which decides its prize, but mostly its finish. I recently made a short blade for a Katzbalger (around 60cm). The blade itself took me 4-5 hours to forge. A very simple polish will take a whole day, a more thorough one with some scratchmarks left may take up to 3 days, for a mirrorlike appearance I will have to work on it for weeks. I just wanted to state that I find this subject very intersting. I have a question regarding some of the best preserved medieval swords. Specifically I am thinking of the Sword off St. Maurice Turin which appears in the photos I have seen to have a well ppreserved blade though I know there are other blades out there which are well preserved. Does the steel on this blade appear more gray than modern steels? How would one go about commissioning a blade with a more gray finish if this indeed is closer to the historical appearance? I know that japanese blades (swords and others) got repolished when resharpened, but the culture has a wide assortment of old swords in their native state. Its not hard to think that the same wouldn't apply for any well used european blade. But I second the long list of variables that would come into question. If its about new swords-do it how you like it, but if its about how they were done, again I'm sure the smith said, "Well, we'll do it how you like it." This subject is particularly important to me as well,a s it is a non-neglectible part of my PhD studies - and as I recnetly took up playing with hot metal too ; and, as it has been said already, this question remains unanswered. Though yet I must add, if that was not already the case, that we should be weel aware of the changes the preservation of archaeological objects can have put on them - either conservation of a parlty decayed artifact, or museum preservation/cleaning and the like. I believe that grinding/finishing was an important part of the weapon-making process - something which has been vastly overlooked by academics so far. Unfortunately, at the moment I am on holidays, which means my papers are not at hand, but strong evidence suggest that most weapons - swords, mainly, were given quite a thorough finish (including burnishing). I have seen quite a number (never enough, though ) of peices in several museums in Europe. And my conclusion at the moment would be that finishing was generally brought to a very advanced state. However, people then woudln't go mad at a small scracth mark remaining - even on high-end artifacts like those I have seen in Vienna for instance. How would one go about commissioning a blade with a more gray finish if this indeed is closer to the historical appearance? There are several methods; you could use a slightly rougher wetstone for the final finish than you would normaly use, you could also "scratch" the surface with fine steel wool or use a mild acid. Each of these methods would reward you with a grey looking surface. The obvious way of course is to also use a steel with a lower percentage of chrome. What is the exact subject of your studies (if I may ask)? I just finished my thesis for my Master of Arts degree (Magister Artium), so I am curious if there are any connecting points. The main subject of my work were the decorations on germanic lance heads from the well-known bog finds in southern Scandinavia. I've seen armoring websites that suggest green 'Scotchbrite' dishwashing pads for the same purpose. Back 'in the day,' time/labor was cheap and steel was expensive, so getting something polished up was less costly than today, perhaps more desired to show off the material? The Japanese polishing system is a bit of frozen 1000 year old technology, so we know what they were doing with a fair degree of confidence in that part of the world. Ethnographic edged tools (made for working, not tourists) with original finish might give some indication of acceptable finish standards in pre-industrial society; if you can extrapolate that back to the mind of the medaeival metalsmith who may have been working with a similar attitude, you get your blades polished, but not to the degree evidenced in the Japanese sphere. I expect the Japanese polishing system has aquired some extra attention to detail due to it's milllennium-long frozen state, but that's just a guess. The royalty/high-end market ALWAYS wants polished to a high degree! I use a 3m "synthetic steel wool" for polishing things. It's just like the dishwashing pads but much tougher. It comes in various grades, up to 000 if I recall correctly. I like it because it lasts longer than steel wool and doesn't shed little bits of steel everywhere. I believe that grinding/finishing was an important part of the weapon-making process - something which has been vastly overlooked by academics so far. I agree. The finishing of a piece after forging (or casting, in case of bronze), is by far the most labour intensive, if you want to get a decent finish on the piece. As a result, a lot of effort must have been made to forge the pieces to such a high level, that it drastically reduces the time to finish the piece. The same experience I have with my bronze castings. I know that in that case, the majority had an extremely high finish. The quality of the casting can make a difference of 3 to 30 hours of grinding and polishing of the same cast to get to that level. So I spend a large amount of effort in getting a better casting. I assume the same applies to smiths who made tools or weapons that were intended to have a high quality finish. For tools and weapons that just have to be sharp and do their job, regardless of the finish, very different standards would apply to the smith. You also get a much deeper appreciation for the high quality work if you know the amount of grinding that's required. To a modern bladesmith, making a migration period torsion-damasted sword is a huge amount of work even with powertools. The actual forging time is almost entirely negligable by comparisson. So I'd expect that at a bladesmith's workshop, you'd hardly see any forging being performed, but people endlessly grinding metal. At the average blacksmith, who'd just make tools with hardly any finishing, it would probably be the exact opposite. Keep in mind though that if labour is cheap, it's cheap for steel making as for steel polishing. However, it's of course important to keep in mind that before you've got a good piece of steel for a sword, it takes a huge amount of labour. So while the finishing will add a lot of extra cost to say a sword, it's not the only thing to make it expensive. ...The actual forging time is almost entirely negligable by comparisson. So I'd expect that at a bladesmith's workshop, you'd hardly see any forging being performed, but people endlessly grinding metal. At the average blacksmith, who'd just make tools with hardly any finishing, it would probably be the exact opposite. The precision, or attention to detail in the forging/shaping of a blade is not just a matter of reducing the amount of time spent on finishing. It is as much or more about shaping the tool/blade in such manner as it will perfom/funtion in a satisfacory manner. To make an edged weapon the craftsman need a certain level of awareness of shape. This is expressed not just in the finishing of the peice, but all through the process of the making. Each step has to be finished just so. This is why a weapon smith will have a different approach to his craft than has the village blacksmith. The village blacksmith, as you have remarked have diferent criteria for the funcion of his products. He makes nails and hinges and and agricultural tools. Most weapons are by nature (both socially and functionally) of a different order. Something that is striking in this regard is how well shaped the earliest iron swords were: just look at those Hallstat swords that were made of iron. That is a shape that is pretty complex to forge. It shows that already at the beginning of the iron age, the art of shaping by forging was well mastered (by the weapons smiths). It should perhaps not come as a surprice, since quite a bit of the shape of the bronze swords were possibly acheived by cold forging and frequent annealing. This is a process that will not leave so much trace in the material (if the annealing is thorough) but will leave to a more homogenized and fine grained bronze: a good setup for the final hammer hardening of the edge. 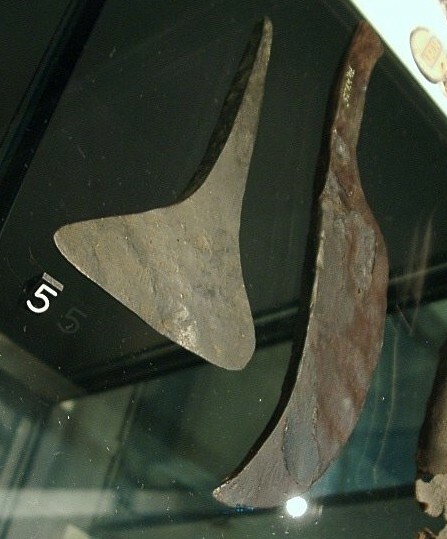 Surviving moulds show that the cast blade many times lacked the typical details of the finished blade. Those details must have been shaped by forging, chiseling, scraping and grinding/polishing. That finishing techniques had been perfected during the bronze age is very natural. Bronze age artifact are statements of the high level of craftsmanship and well mastered shaping and finishing tehniques. This knowldege is easily applied to working with steel/iron. I think it is a mistake to think of finishing as a separate thing that you apply to varying degrees after the object has been made. Finish is actually the last stage of making. This is when the object reaches its final shape, not just a surface finish. During finishing, the details of a swordblade, its cross section, ridges, fullers, grooves, decorative lines, edge geometry and surface finish is gradually more and more refined. This is why the novece bladesmith often finds the finishing of bades so laborious. It is not just that it takes time to remove small amounts of metal to get a shiny surface, it is also about making acute desicions about the shape of the blade. When uncertain about edge thickness, edge angels, depths of fullers and shaping of points, the trouble with scratches is mutliplied: shape and finish gets in the way of each other. As one learn more about blade making, final shaping and surface finishing is one and the same porcess. Whith this attitude, finish is not just a matter of making the metal shiny. It is an integral part of the making of the weapon. When you focus on the smallest details in the blade, surface finish comes as part of this. This is also an explanation to why you might find "flaws" in finish and shape of historical weapons of highest quality: they were functional tools. Shaping and finish is what it is for reasons other than just looking great. Surely, the craftsman was proud of his work and wanted it to look its best, but finishing was still part of making, a step in the defining of shape and function. A scratch her or there or the rare pit left from forging is not that critical. You see assymettrical blades and hilts and even welding flaws in peices of higest order. As long as this did not diminish overall function, it could pass inspection. Today most enthusiasts who order costly custom work could never stand this kind of character in a hand made sword. This is because the sword today fulfills a completely different need. Going through museums today we see surviving examples of the work of ancient craftsmen. We are mesmerized by the presense and magic of time. There is also mystery. All this leads to a romance focusing on age and and an earthy worn look. We want our contemporary objects to share this aura: to look "handmade". In reality, these objects looked very different when new. If we want to get an idea of what medieval weapons might have looked like, we can look at 15th C flemish paintings (Memling has many examples of this type in his art). There might be cases of artistic licence and the case that the objects depicted belong to the highest class of society: still we see armour refleting the landscape and blades reflecting the armour. On indoor scenes we can see how eating knives reflect an orange or a candle. Mirror polish was not something alien to medieval man. It could be done and was done on those peices that got the best treatment. I think these were more comon than we normally think. Surely, also very crude and badly made wepons were produced. Here we see little in the way of crisp definition of shapes amd surfaces. I do not think they represented a standard level of craftsmanship, rather are examples of what happens when someone that is not a professional specialist makes a weapon in times of urgent need. Something we also need to realize is that these objects were carried and used oer a long eriod of time. They had a working life. If someone in the future was to judge the level of laquer work of the typical 20th C car by those specimens "surviving" on scrapyards, we would get a very strange idea of what traffic on 20th C streets would have looked like. H highly poished weapon that see some actual use will bear witness to this. There will be scratches and nicks and the surface will be tarnished. This might be adressed by some touch up and polish, the edge will be resharpened. Sometimes this will hapeen many times. The result is something that deos look rather different from the newly made sword. I just made it back in town and it looks like this thread is doing very well. During the Celtic iron age most swords were one of the highest status items, so it is only natural that the finish is going to be of that same quality. One thing that is often over looked with this is that the quality of workmanship for a sword is going to be consistent for the blade, hilt, and scabbard. You probably aren't going to find too many examples of a very high quality blade and scabbard, but a rather crude hilt. Like Peter mentions with being able to see a difference between the work of a local blacksmith and a specialized weapons smith. There is going to be some differences from one to the other in terms of social status of whom it is being made. Swords are probably going to be at the top of the list along with maybe some more ritual knives, daggers, and such. Many spears would have been up in this level of quality. Spears and maybe every day use knives are probably two things that would probably have one of the widest ranges in quality and finish. If I can get them to post, a gentleman from our Kelticos website posted some good line drawings of polishing and sharpening stones in the following thread. One of the things that hasn't been brought up is some of the different ways of finishing a piece. While a finely polished piece was probably the most common, we do see the iron age celts being themselves and decorating in all manor of ways. Navarro shows us some great examples of blade etching. Another thing we see is texturing both on the blade and in fullers. A number of Port style double fullered blades have a range of texture in the fullers, while others are polished to the same level as the blade. Filework is another thing we do see a bit of even. This usually seems to be to create a series of fine parallel lines over the entire surface of the piece. One of the most impressive pieces having this is a spear with a prominent mid rib, so it wasn't even like they were fining a flat surface. The thing is that there are probably even more example of this type of thing that we just haven't noticed yet or can't be seen in its current state.